Batman is sullen: Crime in Gotham has been silenced, but not by justice as much as by fear. Fear of Superman, dictatorial ruler of the world, and his marching soldiers. It started five years ago, not long after the night Clark Kent awoke to the first sound of two hearts beating inside his wife, Lois Lane - hers and their growing baby's. Lois and Clark embrace in the joy of this discovery when Lois receives an anonymous tip about a crooked councilman taking a pay-off and prepares to leave. Clark offers to join her but she refuses, insisting it isn't necessary. There appears to be a job for Superman, anyway. They kiss, and she tells him to "Go. Save the world." He finds Batman, in Metropolis on his way to S.T.A.R. Labs and in the middle of a fight with some street toughs. Superman proposes a rooftop rendezvous and says he has news, but the World's Greatest Detective has it figured out already - he can see the fear and joy all over his friend's face. Meanwhile, at the docks, Lois and Jimmy Olsen are on the lookout for their councilman. Jimmy gets his camera ready, but that's not the councilman... and that's a gun! Batman seems flattered to have been asked to be the baby's godfather. When else does Batman smile? 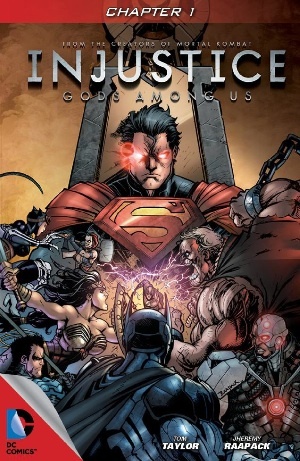 Story - 5: As we know, some fans of the DC Universe and of Superman in particular have expressed dismay that a central feature of the forthcoming Mortal Kombat-style fighting game from which Injustice: Gods Among Us takes its name (being the comic book prequel/tie-in) will be the pitting of hero against hero. "What's the point of having heroes if they don't act heroically?" is the question at this dismay's heart, and I confess to being somewhat sympathetic with the sentiment. Then again, actions can only be described as heroic if they're in an appropriate context, and from what I see in this opening prequel chapter, context won't be in short supply. Leveraging the tried and true approach of opening on a dystopic present in order to set the shocking stage of the present day and then flashing back for likely the bulk of the actual story as the past catches up with the future, it's not long before we know, in this Elseworld-by-any-other-name, not only that Superman is a global dictator but also that he wasn't always. And that right there, frankly, is sufficient for me to keep my mind open as this thing unfolds. I can handle a "dark" Superman if that darkness is used to articulate the light at his core. And so I will here. In an interview with Comic Book Resources, writer Tom Taylor said, "This series really is the most tragic thing I've ever written." Only ten pages in, with Jimmy seemingly dead and a pregnant Lois at the mercy of Harley Quinn and The Joker (who just shot and possibly killed Jimmy), it's not hard to see how this is easily going to be the case. To IGN, Taylor added: "This series is brutal and nasty [...and ] isn't the book you give your kids [...]. In fact, I'd like to apologize here and now to my own kids for what daddy did to the superheroes." Indeed. But no apologies necessary to us, just yet - having The Joker (or someone) murder a Lois pregnant with Superman's child may strain the borders of taste and originality (assuming this is what Taylor has in store), but still how else are you going to turn Superman from the Man of Steel, symbol of light and hope, into Warlord of Iron? It had better be extreme, right? Art - 5: Raapack's rough, ink-heavy style calls to mind parts of James O'Barr's The Crow and is suitably dark and blunt for the troubled times portrayed. Also, using The Joker at the end and putting that wide-brimmed hat on him also called a particular scene from Alan Moore's The Killing Joke disturbingly to mind, though there's nothing about the framing here to suggest a direct inspiration. Cover Art - 5: Apart from technical execution, what a cover has to do to win me over is convey the central conflict of the story while neither giving too much away about specifics nor (especially) contradicting the story in any way. This one does everything right, and gets top marks accordingly.